Poser is a 3D universe to illustrate and animate in. Whether you've just begun your journey into graphics or you're a seasoned professional, Poser is your gateway to an experience that is infinitely creative. Design your 3D world with gigabytes of included content from Poser's library. Set the scene with real-world props and 3D elements. Populate and animate scenes with ready-to-pose, fully textured animals and humans. Start making 3D art and animation in minutes. Whether you create for interactive media, animation or the web, there's always a need to integrate the human form. Poser delivers the power of interactive 3D figure design, offering infinite opportunities to portray human diversity, form and expression. Design with the human form for art, illustration, animation, comics, web, print, education, medical visualization, games, storyboarding, pre-visualization and more! 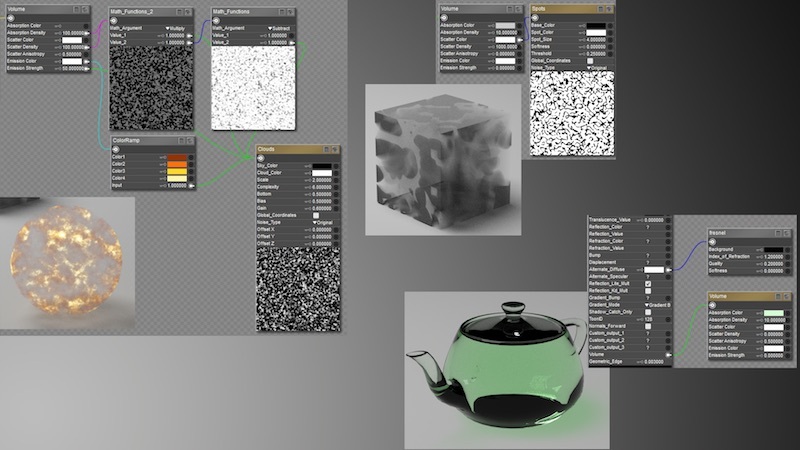 Poser Pro includes all Poser 11 features in addition to exclusive Pro ONLY features. Poser makes working with the human form easily accessible with an intuitive user interface. Human and animal models are included for you to start designing and posing immediately. Click-and-drag to sculpt faces, pose body parts, or create various ethnic varieties. For those who require finer control; full body morphs, facial expression morphs, and bone rigging are available for any figure. All features and models are provided in a natural 3D environment for realistic depth, lighting and shadowing on any figure in any pose. Quickly and easily create shape variations with Poser's brush based morphing tools. With Poser, human and animal models are prepared for you to start designing and posing immediately. Figures are pre-rigged so artists can click-and-drag to pose body parts, sculpt faces, or create ethnic varieties. Thousands of poses, morphs, clothing, hair, materials, and accessories are included. Poser's powerful lighting and rendering tools deliver high-quality artistic effects. Create renders with natural lighting, shadows, subsurface scattering for realistic looking skin, caustics and volumetrics for smoke, fog and cloud effects. Customize your final output in many styles, including photorealism, sketch, cartoon, silhouette, real-time comic book mode and more. Poser's animation tools help you create stunning, realistic animations without much of the repetitive work involved in animating figures. 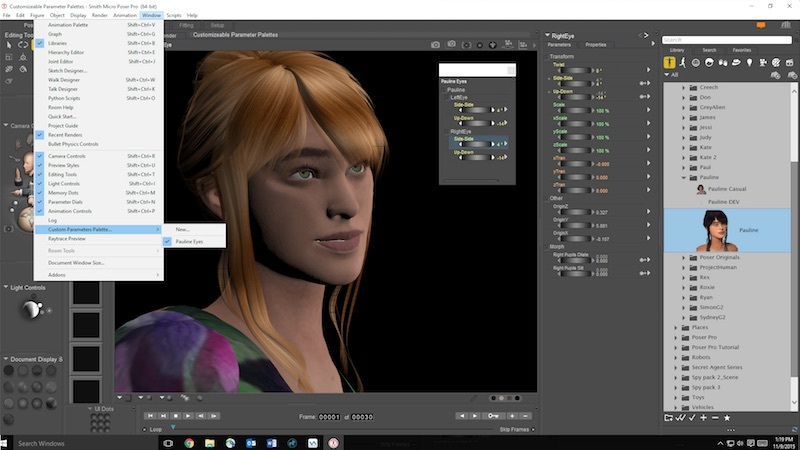 Poser includes automatic keyframe creation, non-linear animation, lip syncing and a walk simulator to simplify the animation process. Dynamic props and bullet physics move with your figure and add realism, bounce and jiggle to your animations. Clothing, table cloth, curtains drape and deform just as they do in real-life, while hair can be grown, styled and controlled dynamically as if blown by the wind. 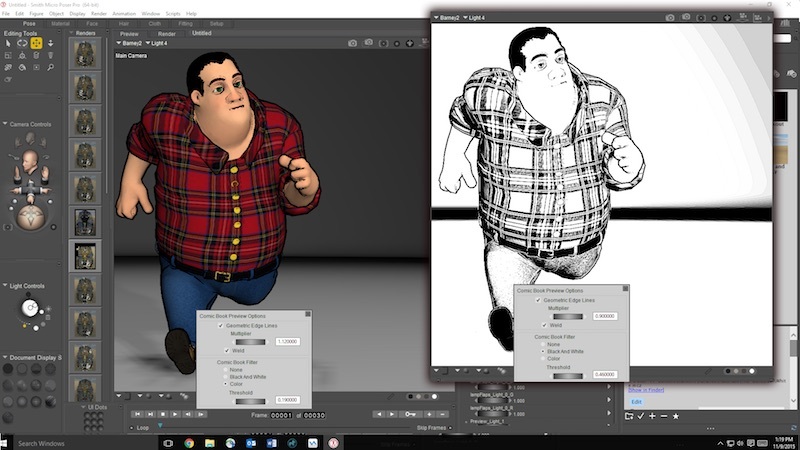 Fit for Professional Creative Environments, PoserFusion plug-ins transform Poser into a character animation pipeline that will transport your Poser scenes into 3ds Max, Maya, CINEMA 4D and LightWave. Perfect for users working in industrial and architectural design, pre-visualization, theatrical set design, gaming prototype development, storyboarding, illustration and animation. 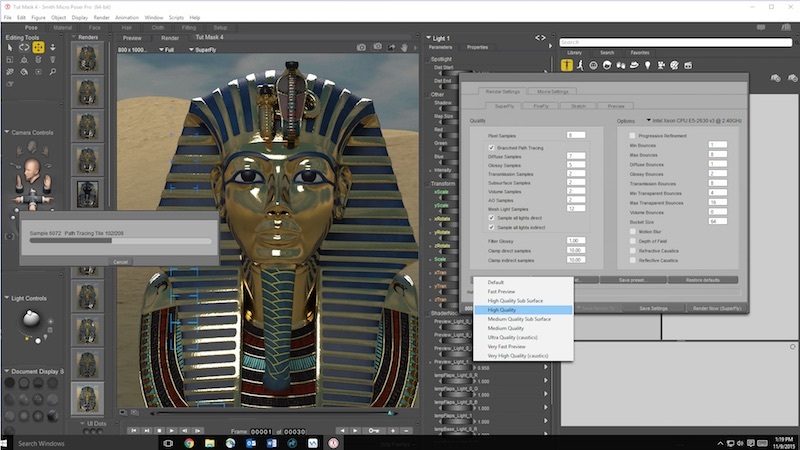 PoserFusion will enable you to add 3D Poser characters to any project, saving you time and resources. Control all your comic mode settings with one easy-to-access panel. New Geometric Edge Lines automatically produce a geometry-based outline around figures which make amazing "ink" lines in OpenGL preview. The width of the geometric outlines for each material can be adjusted with settings in the Material room. You can create different "ink" weights for different parts of your figures and even set the outlines' width to be controlled by key frames in your animation. This allows dynamic adjustment of "ink" weight in an animation.